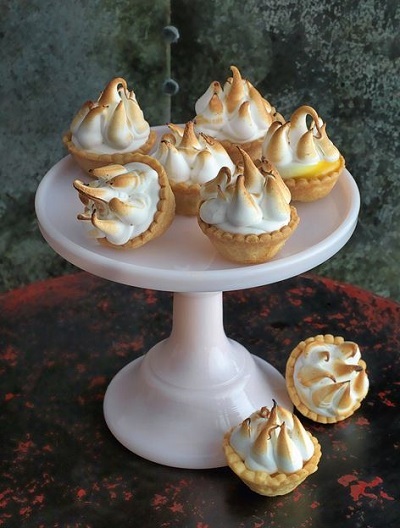 These mini lemon meringues are a little labour of love and will disappear faster than you can make them. To give them that wonderful, toasted, two-tone finish, you will need a blowtorch – easily available from a DIY store. Otherwise just pop them in the oven until brown and serve! Method for each of the three parts to become one amazing mini tart! Combine briefly with a wooden spoon, then add the butter. Using the spoon or your fingers, blend them until they come together. Sift in the flour and quickly work everything into a dough. Shape into a flat slab, wrap in the cling film and chill for 1hr before use. Grease two 12-hole 5cm mini-muffin tins with a little butter. Roll out the pastry on a lightly floured surface to 3mm thick and cut out circles with a 6.5cm fluted pastry cutter. Use them to line the tins, carefully pressing the pastry right down into the base. Chill for 30 minutes. Heat the oven to 180°C/Gas Mark 4. Line each tartlet case with foil and fill with beans or rice to bake blind. Bake for 15 minutes, then remove from the oven, lift off the foil and beans or rice and return to the oven for about 5 minutes, until golden. Place all the ingredients in a heatproof bowl and set it over a pan of simmering water, making sure the water doesn’t touch the base of the bowl. Cook, stirring constantly, until the mixture starts to thicken. To check whether it’s thick enough, dip a wooden spoon into the curd, then run your finger down the back of it; it should leave a clear channel. Pour the curd into a clean bowl and leave to cool. Pipe or spoon a heaped teaspoon of lemon curd into each tartlet. Put the egg whites in a large, clean mixing bowl. Add the salt and lemon juice and start beating with an electric mixer. Once bubbles begin to form, begin to add the sugar a tablespoonful at a time and beat until you have a stiff but silky-looking meringue. Using a piping bag fitted with a 5mm plain nozzle, pipe circles of small peaks on each tartlet. Place in the oven with both the fan and grill switched on and leave for a few minutes, until browned – or use a blowtorch to caramelise the meringue evenly all over and give a defined two-tone effect.